Lets begin with what a blind tasting isn’t. A blind tasting isn’t selecting 3 bottles of bourbon and having your spouse pour them while your back is turned. True blind tasting is when you have no idea what will be in the glass. It could be Pappy Van Winkle 23 or Cleveland bourbon. It’s up to you decide whether or not the bourbon is good. 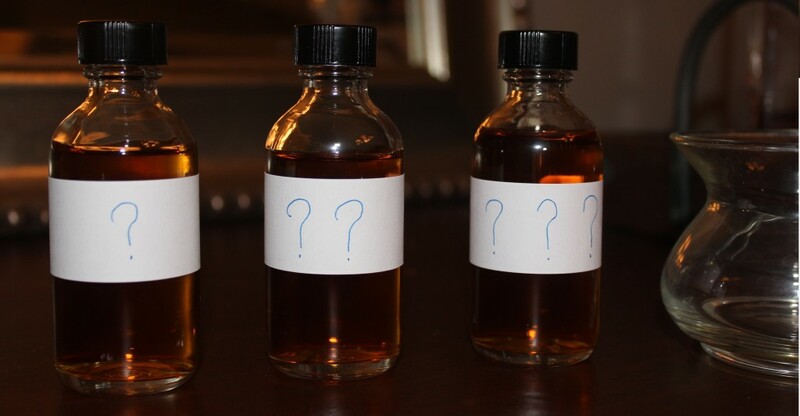 True blind tastings reveal how good your favorite bourbon is. Maybe I have a twisted sense of humor but there’s nothing funnier than seeing a guys face when they realize they rated their favorite bourbon at a 70 or less. – I tend to like sweeter bourbons. – Buffalo Trace is probably my favorite distillery. – My palate isn’t as great as I thought it was. I can usually get the distillery right but before blind tasting I assumed I would be able to call some of my favorite bourbons without a problem. Usually, that isn’t the case. – Cost doesn’t always correlate to quality (no surprise but still important to remind myself). Take a look at most reviews. Any bottle $50+ is going to be in the 90’s and 95% all of reviews fall between 85-95. If I pay more than $50 for a bottle I want it to be good and I will even lie to myself to prove myself right. Never underestimate the power of price, label and marketing. Blind tastings remove all 3. Option 1 – Invite friends over and have the bourbons poured before they arrive. It’s fun to be “in the know” while they’re tasting. Not being able to partake in the tasting usually eliminates this option for me. Option 2 – Everyone brings a bottle without revealing the label. The best way is to use an unmarked bottle. You’re not fooling anyone with a Markers Mark bottle that has the label removed. With this option everyone gets to participate. Option 3 – If schedules don’t align have everyone fill a couple sample bottles and then swap. This method works best with 3-4 people filling 2 bottles a piece. Everyone can taste at their own pace. The most exciting part of the blind tasting is the reveal. After you reveal each bottle compare tasting notes and ratings with everyone. It’s interesting to see how everyone’s taste is different. I may rank Sazerac 18 lower than EH Taylor Small Batch (this is a hypothetical of course) because I don’t like rye as much. I definitely won’t pay more for the Saz but may spend extra on a bottle of EH Taylor Barrel Proof. Most importantly just have fun with it! PreviousInterview With Flask Makers 1776 Co. The small batch and the single barrel are excellent choices. I also love the Angel’s Envy. Great Article! What else were you tasting against the three you picked? Great article. 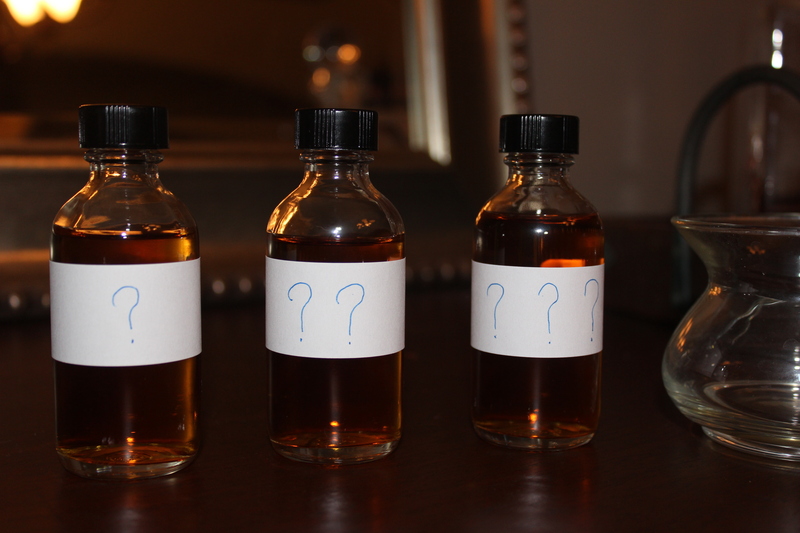 I think blind tastings are easily the best way to figure out which bourbons best suit one’s palate. Even informal tastings work well: When I have guests over, I usually refuse to tell them what they’re drinking until they’ve told me what they think of it. I have a friend that we’ve done this a few times set up as brackets where we had 8 random bourbons and they would go head to head like a March Madness bracket. 1 vs 8 and 2 vs 7 and so on, and you get to learn the one you eliminated all the way up to the end. (We even randomized the numbers so you wouldn’t assume 1 would be better than 8) and you can do just 4 or whatever. You can change up between all barrel proofs or all wheaters or just throw anything you want together. Problem is every time we do this I ‘ve picked out the Pappy or when there was none I picked Eagle Rare 17, so it’s not getting any easier for me to get what my palate wants. This is what the group I am in does: we do a tasting every quarter and for the first 3 quarters we rate the whiskies from favorite to least favorite (this is NOT blind) we tally the votes at the end of the night and the top 3 move on to our quarter 4 tasting that is “blind”. It’s a fun way to learn about a lot of whiskies and about your own palate. Oh and at the end of the Q4 tasting we tally votes again and whoever brought the one with the highest points is consider the whiskey of the year for our group. Here’s how my group does our blind tastings – it’s a pretty good system that took some trial and error to tweak. We pick a category with a dollar limit, something like single barrels, wheated bourbons , or the most fun is “anything goes”. Six or more of us then submit a list of 4-5 whiskeys to an impartial who will not be participating in the tasting. It’s important this person be very knowledgeable of whiskey as picking the lineup is kind of an art. Once that impartial receives everyone’s candidates, he replies to 5 of the submitters with a whiskey for them to bring. This means one person gets to sit out a round and not bring anything. Once everyone arrives with their unmarked samples bearing only their name, the 6th person who did not bring anything will pour the samples while the other 5 are not in the room. The sixth person will know which submitter’s sample is in each glass but that doesn’t matter since that person doesn’t actually know what any sample is. The other 5 will only know that their submission is present but won’t actually know which sample is theirs. We then taste and rate each sample. We allow discussion of notes but our rule is no one is allowed to give their rating/ranking until everyone has recording their votes. This prevents group think and keeps everything impartial.